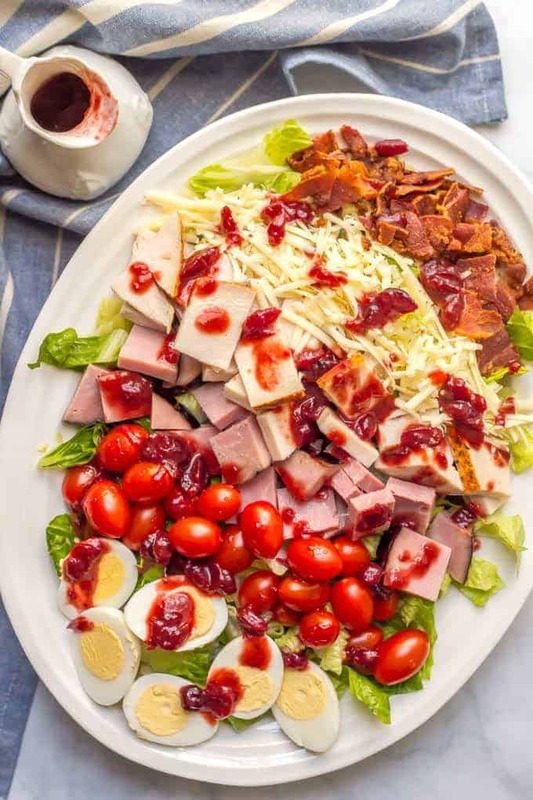 Thanksgiving leftovers chef salad is an easy, light no-cook lunch or dinner to make using leftover turkey, ham, deviled eggs and even cranberry sauce for the dressing! OK, so I’m of course wishing it was still the weekend, but I’m trying to stay positive and keep focused on what’s ahead, instead of what’s behind. And besides the side dishes at Thanksgiving dinner, the leftovers from Thanksgiving are my favorite part of the holiday! I love reheating them, of course, or making a breakfast scramble, but I also love turning them into entirely new dishes. 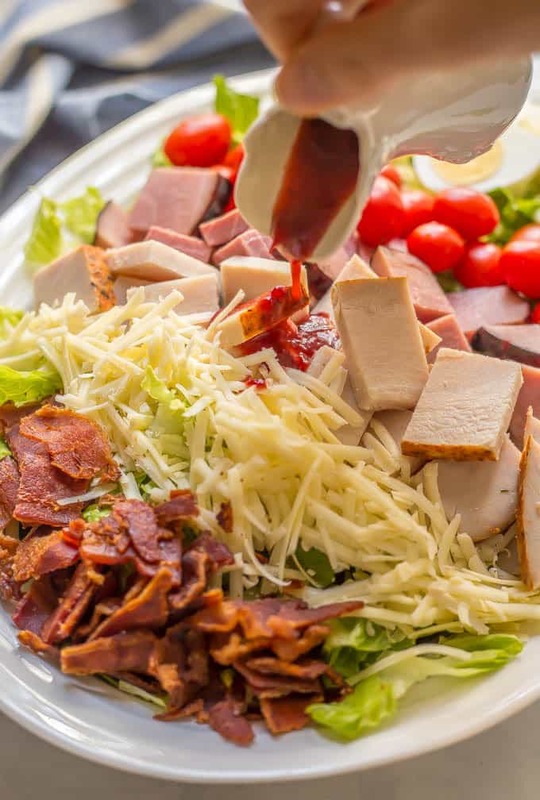 And today’s recipe for Thanksgiving leftovers chef salad is a way to use leftovers without making your pants pop! Well, we’ve got the leftover turkey and ham, of course, just diced up and ready to go. We’ve also got any leftover deviled eggs (or you can just use hard-boiled eggs like I did here) to go around the plate. And we’re using leftover cranberry sauce (my easy 15-minute version) to make the super easy vinaigrette for this salad. 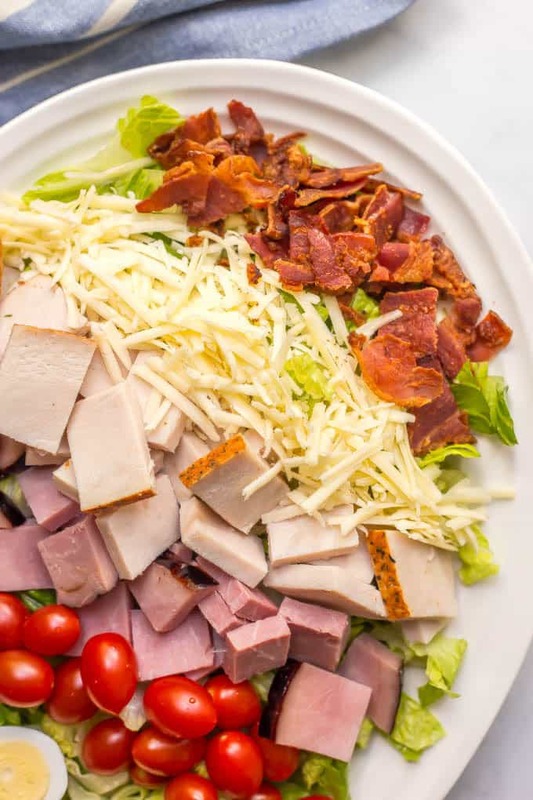 Of course there’s also the lettuce, tomatoes, cheese and bacon that you expect from a big chef salad. I’ve also added mushrooms before, so feel free to toss in any extra veggies you love. 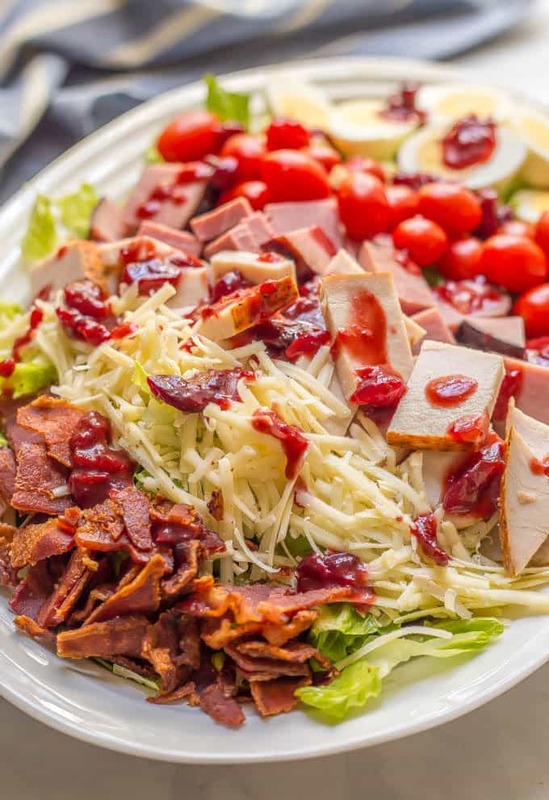 The best part of this Thanksgiving chef salad is that you just have to assemble it, shake up the dressing and you are ready to dig in! 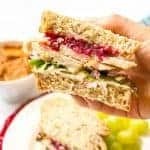 Just make sure to grab your veggies when you are doing your big Thanksgiving grocery store run and you’ll be all set to make this in the days after, when you don’t want to leave the house. 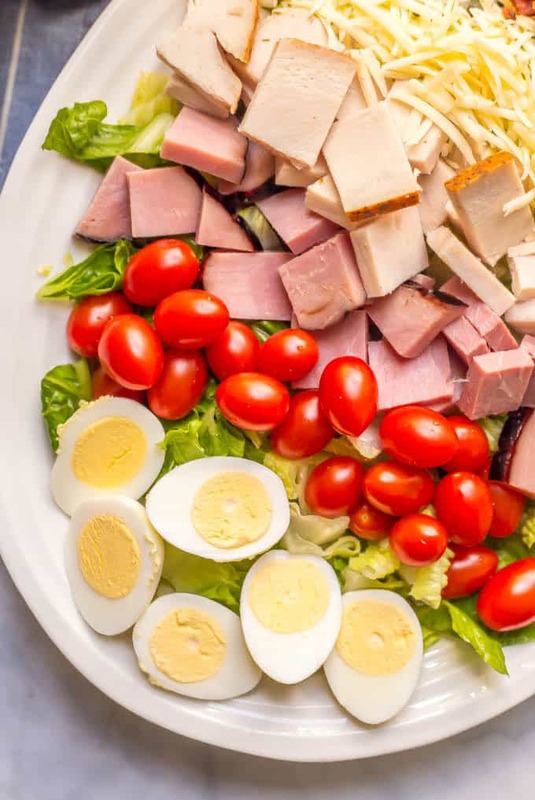 Thanksgiving leftovers chef salad is an easy, light no-cook lunch or dinner to make using leftovers from the big meal! 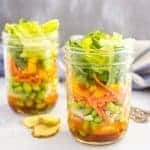 For the vinaigrette, combine all ingredients in a small jar with a tight-fitting lid. Shake and add water, as needed, to get it to your desired consistency. Top the salad with the dressing and enjoy! The amount of water you need for the vinaigrette will depend on the consistency and thickness of your cranberry sauce. Start with 1 or 2 tablespoons and add more until you have a pourable consistency. My 15-minute easy cranberry sauce is chunky and works fine for this dressing. If your cranberry sauce is chunky and you want to smooth it out to use for the dressing, just mix this dressing together in the blender. Feel free to add other veggies to this salad. 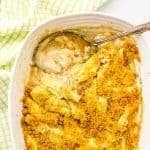 You can also make croutons from leftover cornbread if you have any! leftover salads are the best! This is so creative! 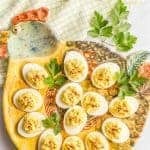 Definitely going on my list of dishes to try after Thanksgiving – I love that you even used the deviled eggs! Yum! And the leftovers strike again! This looks amazing- such a clever idea to do a chef salad with a twist! 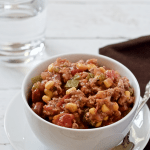 Love this fun and healthy way to use up leftovers! 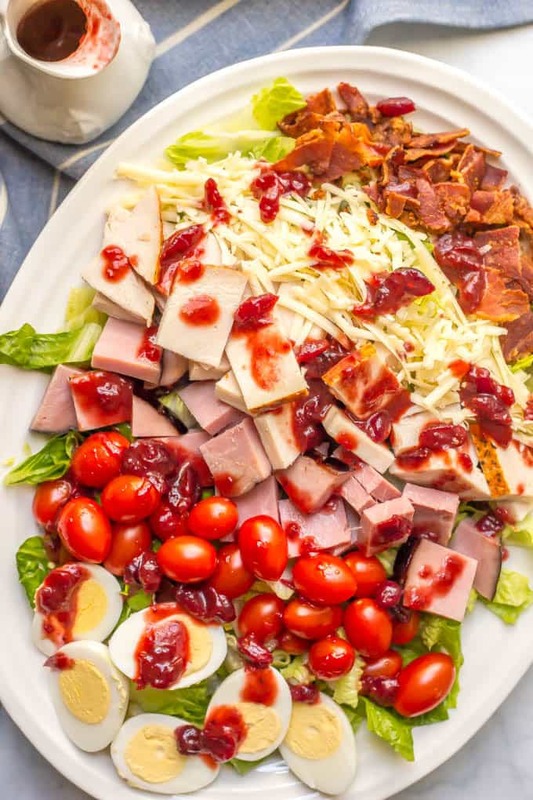 The cranberry vinaigrette is the perfect way to incorporate cranberry sauce into a salad, so creative! Thanks so much Luci! 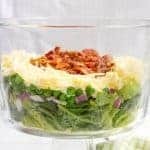 The dressing is so easy and really takes this over the top!